SK Olympics – Mr. Mom – Detroit, USA – Screenkicker! After a strong start for the arid, spider filled, wasteland that is Australia who has the balls to step up and big up their home? Today it’s the turn of Movie Reviewing Machine Rob™. It turns out Rob grew up on the mean streets of Detroit, Michigan. He hustled and took part in dope rap battles until he found his love for movie blogging with his site MovieRob. Over to you MRMR™! I grew up in a suburb of Detroit Michigan called Southfield (which is approx. 10 miles North of the city itself. When Mikey posted about this blogathon, I wracked my brain trying to think of a movie to review that represents the homelife that I grew up with (somewhat). When most people think of movies based in Detroit, violence is the first thing that comes to mind; Robocop (1987), Beverly Hills Cop (1984), Action Jackson (1987), 8 Mile (2002) (that actually happened not so far away from where I grew up near a road called 10 mile. yes the main roads were all named based on their distance from the city center, hence the simplicity of it all), True Romance (1993), Grosse Pointe Blank (1998) and The Rosary Murders (1973). Next, people will think of music and Motown, movies like Dreamgirls (2006), Detroit Rock City (1999) and once again 8 Mile (2002). Then I remembered that the movie Mr. Mom (1983) took place in the suburbs of Detroit and since I hadn’t seen it in a while, I decided that I had found my movie to review. Brief Synopsis – An engineer is fired from his job at a Detroit Auto plant and must take care of the house and kids while his wife goes to work. My Take on it – As you can see from above, I hadn’t seen this movie in 12 and a half years, so my perspective this time is much different than it always was before, now it’s as a parent instead of when I was a child, teen or a single adult. Many of the things he needs to do just completely will go over the head of a child eventhough I recall being amused by those scenes back as a kid. I will always remember the scene in the supermarket where we hear on the loudspeaker the quote “Irv, cleanup in aisle 5” and then hear Keaton scream “I was never in aisle 5 Irv, I swear”, but the thing in the supermarket that got me laughing now is the tampon joke. As a husband, I will never forget the first time I needed to buy feminine products for my wife and the embarrassment that went with it. Over the years, I have coped with this embarrassment and now can do it without feeling embarrassed, but they definitely got that scene right. 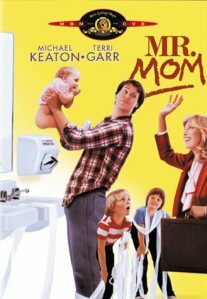 This was one of Keaton’s first movies and he really did it well. He is the devoted father and husband who wants to do everything right, but keeps getting the feeling from others that as well as he does things, it will never be the same as when his wife does them. Most men in a long tern relationship will be able to realte to that feeling. No matter what I do for my kids, they like the way their mother does it much better than the way I do it. Besides Keaton, Teri Garr and Martin Mull are great. She as his devoted (not fully employed) wife and he as her new boss who wants more from her than she is willing to give. One of my favorite scenes in the movie is the obstacle course at the Boss’s party. Watching grown men on tricycles or running with flippers is hilarious!!! This was one of John Hughes first scripts about suburban life and eventhough it doesn’t take place in his native (and more comfortable Chicago) he does it extremely well. Bottom Line – Fun movie that I can appreciate even more as a parent. Keaton is great here as are Teri Garr and Martin Mull. Hughes did this one very well. Thanks again Rob, a brilliant review. If you would like to take part just send me an email to michaelboyd185@gmail.com. 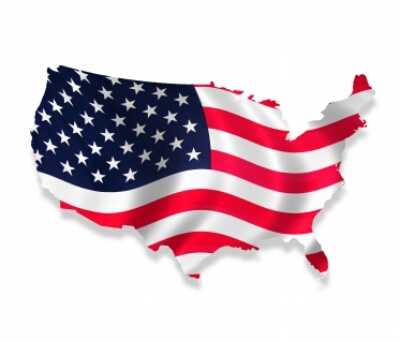 Don’t let your home go unrepresented! Thanks Brian, Is that from KFM? Yep! These are lost drunken men who don’t know where they are, but do care! And these are men who know where they are and care, but don’t drink. This surely shouldn’t be the focus of my comment, but. . .I love how the poster chops off Teri Garr’s legs below her suitcase. Great review Rob! And, Detroit Rock City indeed. Good stuff. didn’t notice that at all. Thanks Tom! Mikey from Screenkicker is doing an Olympics style blogathon. Here is my first review for him based on my growing up in the suburbs of Detroit!. Can’t believe I’ve never seen this film! Great write-up. Plus I forgot Home Improvement was set in Detroit. That’s a blast from the past. Glad you found a good one to review for the Olympics. Mikey, on an unrelated note: I finally figured out what movie to review. Last Kiss (2006), filmed entirely in and around my alma mater, UW-Madison. I don’t remember it being a great flick . . . but whatever. That’s not really the point, is it? Or if you wanted to go a different way you could write about actors or directors from there? I had a quick look and Michael Mann went to UW-Madison. 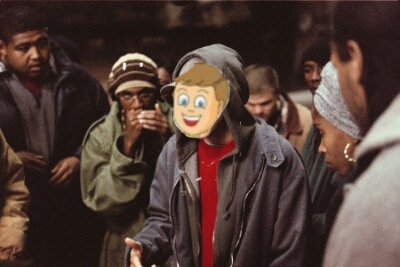 MovieRob played a great Eminem! Good review such a cute movie. I forgot Home Improvement was Detroit… is Tim Allen from there too? Did you know Tim Allen did time in prison when he was young dealing drugs. He only got out because he ratted on other dealers! What a narc! I heard he was a drug dealer I didn’t know he went to jail. Tim the toolman Taylor!! !